Golf and a Wedding at Legends Golf and Safari at Entabeni, and then a few days in Mauritius! We have just returned from a wonderful holiday at Legends Golf and Safari where we enjoyed some golf and the opportunity to go to the Wedding of our good friends Ian Godleman and Lynnette Brooky. Theirs was the first Wedding to have been held on the Extreme 19th Hole at Entabeni. The tee has to be reached by helicopter and is over 400 metres higher than the green below which is in the shape of Africa. The Wedding ceremony was held on the mountain top and after the ceremony we all teed off to see how good a score we could achieve on this totally unique, and very tricky Par 3 hole. It is the highest Par 3 tee in the world and was such a fantastic venue for the Wedding. All the guests enjoyed the unique experience and we all wish them Good Health and Happiness for the future. You can see more about the Wedding on the Ladies European Tour Website. 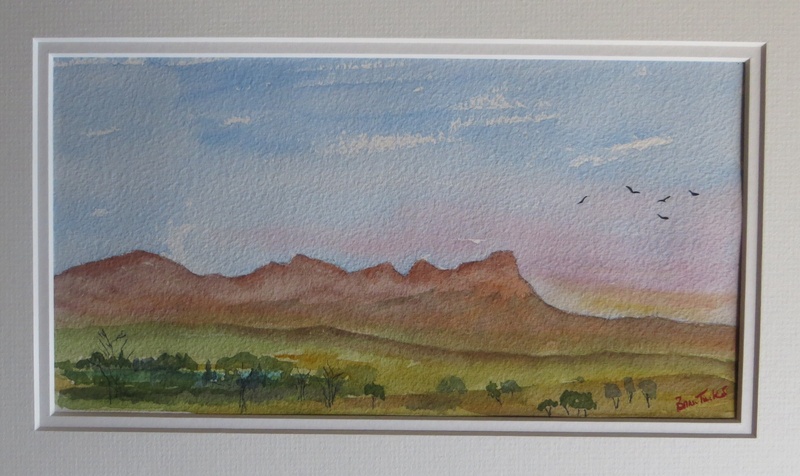 I managed to paint a few watercolours whilst there and I hope you will like them. The views and the animals at Entabeni are really spectacular. I used some web images to help with the animal paintings on this occasion but we were lucky to see Lions, Giraffes, Elephants, Cheetahs, Rhinos and lots of Wildebeast, Antelope and Zebra. The trip to the golf course is daily safari, and one morning the Lions had made a kill just upside of our Lodge! After our great week there we then travelled to Mauritius for some more golf and relaxation at le Tousserok. The location by the Indian Ocean and it’s fine golf course on an island is a really terrific destination. 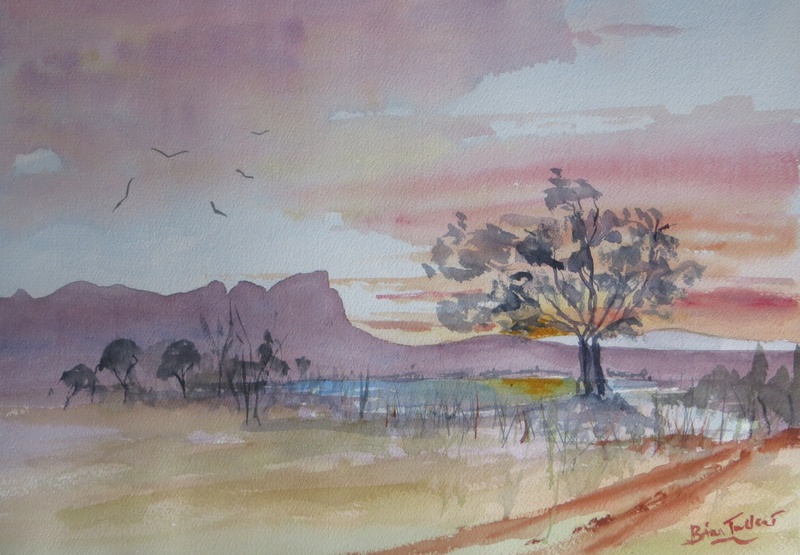 Not much time for painting, but here are two , one of which I painted quickly on the return flight of 12 hours from Mauritius to London. Painting in the cabin was a first for me and a bit tricky with the slight turbulence. 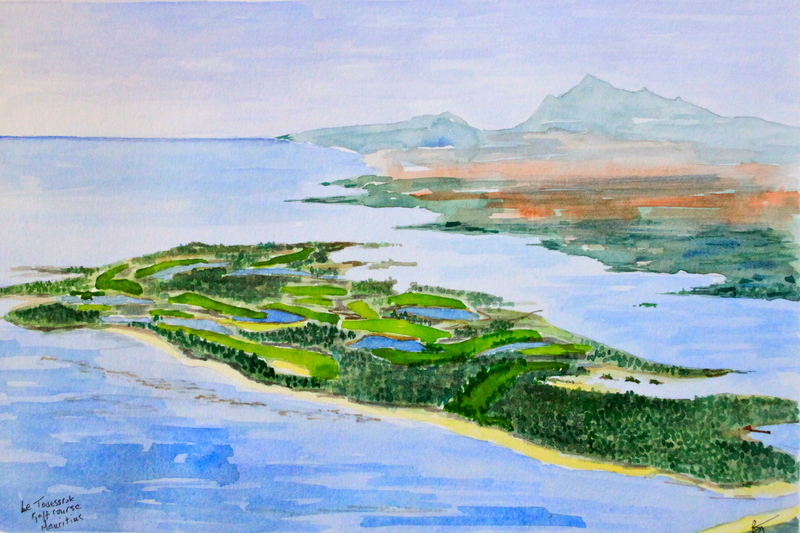 The last painting is one that I painted in 2008 showing the Bernard Langer designed golf course at Le Tousserok. I thought it was worth including it here. Anyway please enjoy these paintings and if you ever get the chance, golfer or not do go to legends at Entabeni,it is really great place to go! Painted on the flight to London.